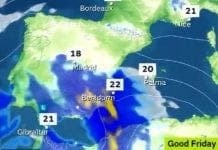 YELLOW weather warnings have been announced for the Campo de Gibraltar and the Costa de La Luz. It comes as storms are set to lash the Atlantic coast for much of the weekend. The latest weather warnings came after a week of heavy rain that caused disruption to roads, flooded rivers and severe damage to several of Marbella’s beaches, only weeks ahead of the Easter holiday period. Thunder and rain are currently affecting San Pedro and the Marbella area. Rain will remain on the Costa del Sol until at least next Sunday, with only Monday and Friday expected to be drier.